As you can see it has 20 pre-defined place holders for your user circuits. Additionally, you can modify the icon menu to add more if you need to. This is a great solution if you have a small number of standard circuits you need to use over and over, but what if you have a large number of custom circuits and managing them here becomes time consuming? The solution is not using the User Circuits menu to manage your circuits. Just create a folder in your defined library and manage them as regular blocks. As you create circuits in AutoCAD Electrical just use the wblock command and save them out to this location. Additionally, you can create subfolders at this location to further organize them and along with a short name will make it easy for you to know what they are. Make sure you use this command and not the standard AutoCAD Insert command. The Insert WBlocked Circuit command strips the outer block away and allows AutoCAD Electrical to recognize the components as smart AutoCAD Electrical components. 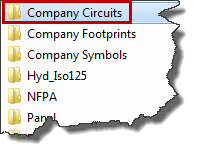 If you keep your custom symbols, custom footprints, and custom circuits in folders outside the standard libraries that come with AutoCAD Electrical there is an added benefit when you upgrade to the new release of AutoCAD Electrical by not needing to worry about what you added to the library of blocks that did not come with AutoCAD Electrical. When you decide to upgrade you can just replace the previous release library with the new library. Looking for more on AutoCAD Electrical? Check out Managing and Creating Wire Layers in AutoCAD Electrical and we’ll be posting more over the next few weeks.